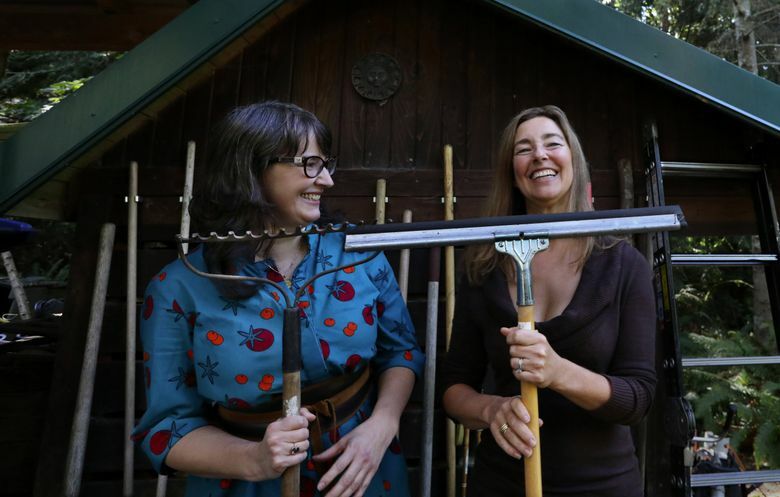 Created by two Bainbridge Island women who were inspired by a Himalayan village society, Buy Nothing links a half-million people with their neighbors and eschews consumerism. When Erika Dudra moved to Beacon Hill two years ago, she didn’t know any of her neighbors. The young chiropractor had just separated from her then-husband and found herself alone in her house with a 3-month-old she needed to feed and clothe. Dudra soon discovered a Facebook group called Buy Nothing Beacon Hill North. The premise of the group was simple: Offer up something that you don’t need, or ask for something you do need. She joined to get rid of a couch, but then started asking for baby things. As a result, “I have a 2-year-old now who basically cost me nothing,” she said. 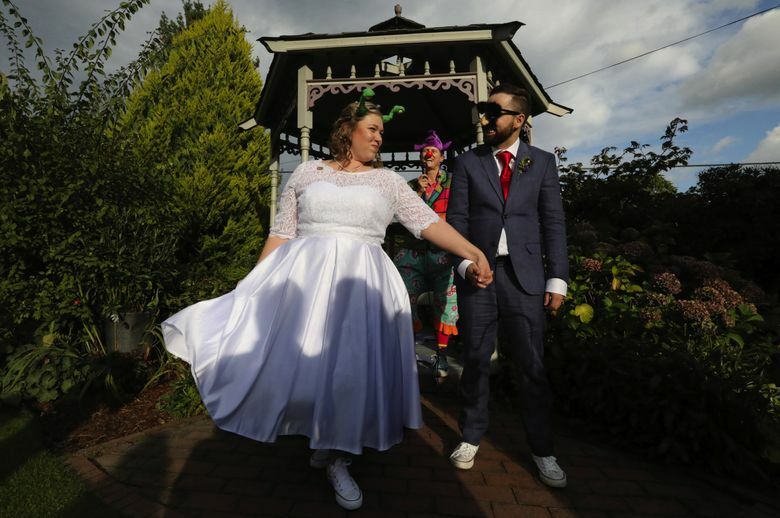 When Dudra remarried on Sept. 21,she threw a “Buy Nothing wedding” with a donated dress, cake, décor, flowers, an American Sign Language interpreter for deaf relatives, and a wedding photographer. Her biggest outlay was $300 for the venue. To participants, Buy Nothing is about more than just fighting consumer culture, though. Today, all of Dudra’s best friends are people she met on Buy Nothing. Every time she walks down to her local coffee shop, she sees someone she knows from the group. She is one of almost 47,000 Seattleites who are part of a Buy Nothing group in their own neighborhoods. Since this network was started in 2013 by two Bainbridge Island women, members and volunteers have spread the Buy Nothing gospel to more than half a million people in 20 countries, from the Philippines to Luxembourg. Dudra herself has a goal of offering up a gift every day. “The more you participate in the project, the more you get out of it,” Dudra said. Buy Nothing co-founder Liesl Clark likes to say the project is one-half internet giveaway group and one-half prehistoric Himalayan economics. Local internet giveaway groups are nothing new: Craigslist launched its “free” section around 2000, according to a Craigslist spokesperson. Arizona resident Deron Beal started The Freecycle Network in 2003 after a fruitless quest for a thrift store or friend to take a mattress he didn’t need; today, the site claims more than 9 million members. Bainbridge Island’s local Freecycle site is where Liesl Clark met Buy Nothing’s other co-founder, Rebecca Rockefeller, who runs a Bainbridge nonprofit. But while Freecycle’s goal is mostly to avoid waste, Buy Nothing has a more esoteric inspiration. This inspiration comes from high up in the Himalayas, where Clark has filmed archaeology documentaries for National Geographic and the PBS series “NOVA.” In 2007, Clark visited a village in the Upper Mustang area of Nepal that didn’t operate on currency. “Your money is no good there,” Clark said. Instead, the village of Samdzong operated on a “gift economy” — when a villager needed something, she or he would simply ask. Residents kept communal goats and sheep and took turns watching each other’s fields. 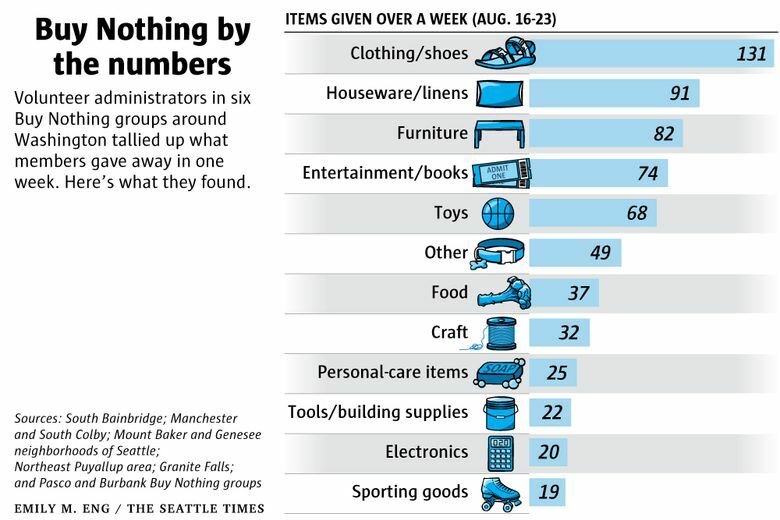 Coming back to the U.S. with this new idea filling her head, Clark became more frustrated with Freecycle, which has close to 2,000 Bainbridge Island users. “It wasn’t ‘giving’ — it was posting what you want to get rid of,” Clark said. One day, Clark scrolled past a Freecycle post for “curly sticks” from a corkscrew willow tree. “Who would give away sticks?” Clark thought. That’s how she met Buy Nothing co-founder Rockefeller. The two started seeing each other because of Freecycle more and more. They shared a passion for anti-consumerism, which is where the group’s name comes from: “We really needed to stop buying stuff — just buy nothing,” Clark said. They started talking about launching their own project through Facebook. With Facebook, users could see names instead of handles, and the rules were much more flexible. They could be as silly as they wanted. One morning in July 2013, Rockefeller started a Facebook group at 10 a.m. By noon, the group had 300 people, Rockefeller said. “I’ve lived here for years and I don’t go out and talk to anybody,” Sellen tells Clark in the video. Years later, the two still meet up for tea. Buy Nothing grew exponentially. Within a month, there was a sister group in North Kitsap, then one in California, then Seattle. 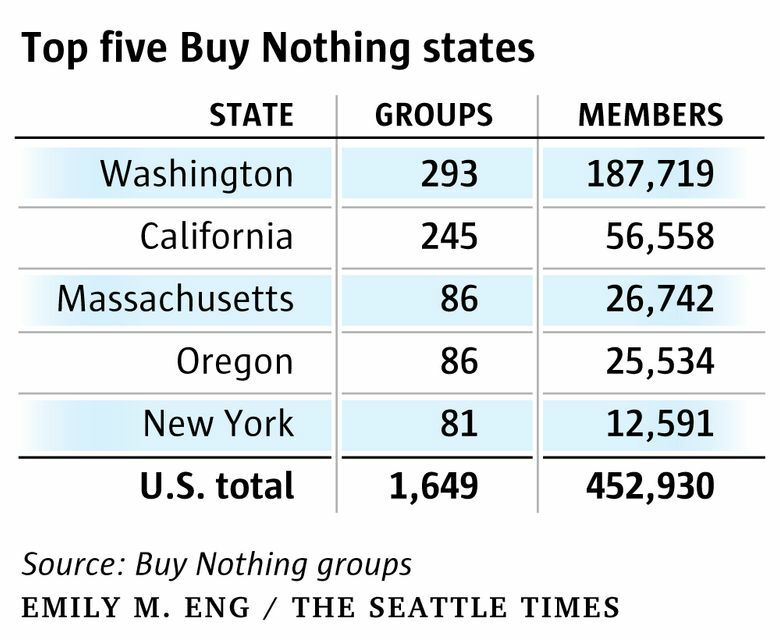 By the end of 2013, 57 groups totaled 10,000 members across the U.S. Then, Buy Nothing spread to Canada, Australia, New Zealand, and the U.K.
Washington remains the U.S. state with by far the strongest following: 187,719 members in 293 groups, according to Buy Nothing volunteers. Those early days were very exciting, Rockefeller said. “You get up in the middle of the night and walk around your house thinking ‘What can I give away? I’m going to give away my entire house and get new things!’” Rockefeller said. As the number of members grows, groups have to divide like cells, to keep notifications manageable. Lissa Jagodnik, who helps manage Seattle’s groups, joined the Southeast Seattle Buy Nothing group when it had 250 members in February 2014. 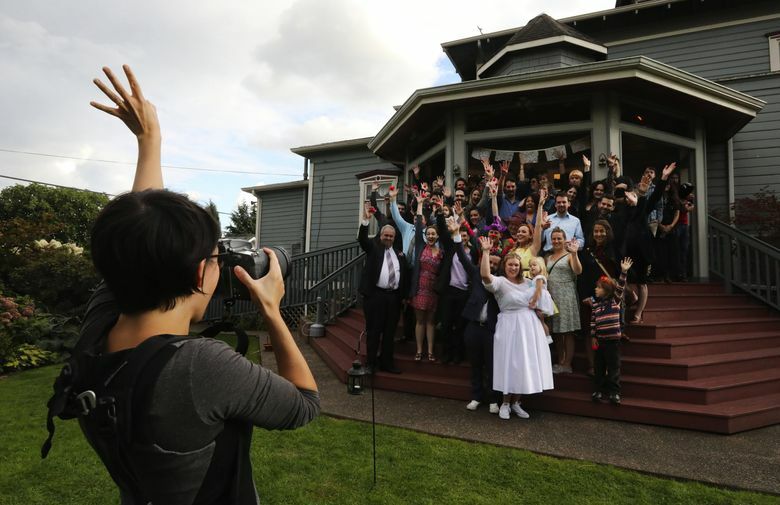 Today, Southeast Seattle has seven groups totaling more than 6,200 members. Clark and Rockefeller think the site exploded because its goal is not just to give away free things: Users are encouraged to share the stories behind why they’re getting rid of “great aunt Enid’s couch,” said Rockefeller. They encourage people to be colorful, or intimate. Typical internet shorthand like “ISO”— ‘in search of’ — is discouraged. A small army of about 3,000 volunteer moderators spends hours every day verifying would-be members and making sure the rules and codes of conduct are followed. Their tasks often involve dealing with people who disagree with the rules, want to talk about politics, use the groups for marketing or promotion — or are upset that a neighbor who didn’t pick up something when they said they would. Rockefeller has also fielded plenty of criticism about race and class in Buy Nothing — some groups are very white and English-speaking, and it can be easy to judge a member’s socioeconomic status by what they can afford to give away — and Rockefeller says she tries her best to work against that. The Buy Nothing Project’s rules state clearly that the group is not a charity, but sometimes the admins will mobilize: When Hurricane Harvey struck Southeast Texas last month, they organized their countrywide network to get supplies to people who needed help. Some volunteers even drove from the Pacific Northwest to Texas. Asks and offers generally stick to physical things, but can also ask for people’s time. In March 2014, Kate Goldston, a 33-year-old woman who’d struggled with life-threatening anorexia from the age of 12, posted in Buy Nothing Bainbridge asking for someone to play Scrabble with her. She had just been released from hospice care, weighed 65 pounds, and needed commitments. People responded, and soon Goldston was playing Scrabble every day. Goldston isn’t alone: For thousands of members, the Buy Nothing Project has become a way of life.